Mandy took this photo after sunrise while on a five-mile hike in Sequoia National Park, California. "Clouds would roll in so thick you couldn't see five feet in front of you, but they were moving so quickly that 30 seconds later you could see the lake again, and 30 seconds after that it'd be covered. I took this during an in-between moment—some clouds blowing through, but clear over the lake." D810, AF-S NIKKOR 24-70mm f/2.8G ED, 1/250 second, f/2.8, ISO 100, manual exposure, Matrix metering. Morning near the Grand Tetons. "I'd shot sunrise, then it was, What do I do now? Well, the sun was up, but still low in the sky, and I love exploring ways to make the middle of the day interesting. One thing I like to do is the [small-aperture] starburst sun effect." D810, AF-S NIKKOR 70-200mm f/2.8G ED VR II, 1/60 second, f/22, ISO 3200, manual exposure, spot metering. Driftwood Beach, Jekyll Island, Georgia. Mandy first photographed it at sunset, but thought, I gotta come back at sunrise. When she did she was able to take advantage of the sliver of moon and the rise of the sun. Sometimes slowing down means taking the time to time the take. D810, AF-S NIKKOR 24-70mm f/2.8G ED, 30 seconds, f/22, ISO 80, manual exposure, spot metering. Lupines in the foreground of a mid-morning scene in the Grand Tetons. "The sun was behind me and everything was brightly and evenly lit." D800, AF-S NIKKOR 24-70mm f/2.8G ED, 1/15 second, f/22, ISO 100, manual exposure, Matrix metering. Colorado aspens. "I always do fall colors in Colorado, and a workshop, too. It's one of the most beautiful places." This is a rare no-tripod shot. "I was just walking around an old ghost town, and this was the view down the path leading out." D810, AF-S NIKKOR 70-200mm f/2.8G ED VR II, 1/500 second, f/2.8, ISO 400, aperture priority exposure, Matrix metering. In photography, we want everything to be fast: fast frame advance, fast autofocus, fast glass and a quick look at the results. But there's a contemplative side to the story, especially when we talk about landscape photography. That side has nothing to do with the speed of your gear. It has to do with slowing yourself down. It means thinking about what you're shooting, and why you've chosen to shoot it. It means taking the time to capture what you feel is the essence of a place and the experience of being there rather than taking the quick shot that merely documents the location. All the above was pointed out to us—clearly, concisely and slowly—by landscape photographer Mandy Lea, who travels the country in a camper to photograph "the beautiful places," and conducts about eight landscape workshops each year along the route of her travels. Mandy's busy, but she's not in a hurry. 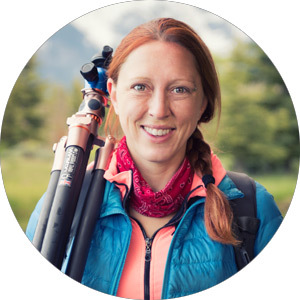 "For me, being a landscape photographer is also about my love of hiking and adventuring and being active," she says, so she's not about to rush those moments of pure enjoyment and appreciation of what the landscape offers the soul, and the camera. Mandy realizes, and points out to her workshop students, the difference between being a tourist and being a photographer. "The tourist is going to drive up and take a big picture and leave," she says. The photographer, on the other hand, arrives and spends time, decides why she likes the area, why it's beautiful to her and why she feels something for the place. Then she takes pictures that capture those reasons. "We all think we're constantly present, but we're not. It takes a conscious decision to be in an area and be mindfully present. I tell people in my workshops that these are concepts for them to grasp, that this is what they should be doing. I always say, 'I know you think you know what you're taking a picture of, but I want you to legitimately define your subject in every single picture." A five-shot HDR image at sunrise in McKinney Falls State Park, Austin, Texas. "I'm standing on top of the waterfall, and it's coming toward me, up to my ankles, flowing down over that edge. I'll do whatever I need to get the angle I want." D800, AF-S NIKKOR 24-70mm f/2.8G ED, shutter speeds 1/13 to 1.3 seconds, f/22, ISO 100, manual exposure, Center-Weighted metering. Wyoming vista, middle of the day, with one subject in mind: the tree. "This is an example of how to make the middle of the day—the worst time for landscapes—interesting. The answer has a lot to do with compositional elements. I liked the wispiness of the clouds, too, and the contrasts, colors and overall simplicity of the image." D800, AF-S NIKKOR 300mm f/2.8D IF-ED II, 1/125 second, f/18, ISO 100, manual exposure, Matrix metering. So there it is in front of you: a vast, beautiful scene. You're inspired, even awed, and you start taking pictures of all that awesome beauty. Not so fast. Mandy has a question for you. "Are you taking a picture of that flower? That rock? That lake, river, mountain? I want you to literally define what your subject is, and then figure out the best way to showcase that subject." It seems like such a basic idea. When you take a photograph of a person, that person is your subject. "People will say, 'I'm taking a picture of this scene,' but what is it about this scene? The flower? The river? I want to know what you're taking a picture of. Is it the way the river is going by the mountain? For every picture I take, when I compose I tell myself what I'm taking a picture of. If it's the bend in the river, I want to know that I'm composing the picture specifically to show off that bend in the river." Mandy tells her students to break the process down to its most basic elements. "What am I taking a picture of? And when I compose the picture, is it obvious that's what I'm taking a picture of?" What you're doing is essentially directing viewers of your photograph and sharing your feeling about something specific in the scene. "It's not everything you're seeing," Mandy says. "First you have to define what's attracting you, and then figure out how to communicate that attraction." Which leads to workshop questions and suggestions—like, "Well, if it's the flower in the foreground, why don't you get lower and closer?" Of course it takes time to ask and answer those questions, both in the workshops and later when the students are out on their own. Which is pretty much the whole point. Taken at Blackwater Falls State Park, West Virginia. 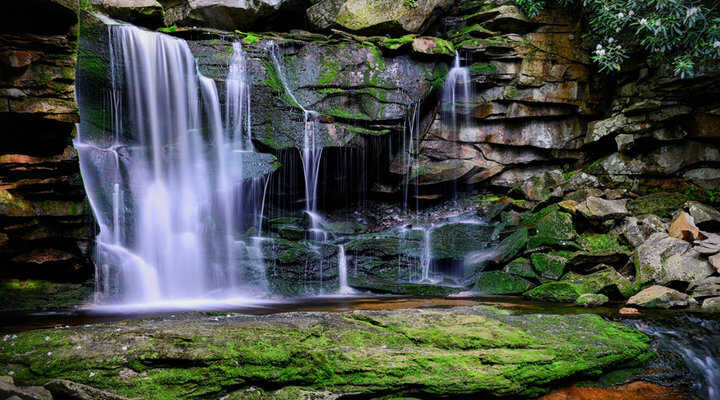 "Waterfalls are a favorite of mine, and there's just the right amount of water at this falls. Too much water can be overwhelming—too white, not enough contrast. Cloudy days are best for waterfalls, and sometimes I have to set up and wait for a cloud—direct sun is terrible for water." D800, AF-S NIKKOR 24-70mm f/2.8G ED, 8 seconds, f/22, ISO 100, manual exposure, Matrix metering. Late afternoon light on the salt flats near Guadalupe Mountains National Park, West Texas, in a three-shot HDR photo. D800, AF-S NIKKOR 24-70mm f/2.8G ED, shutter speeds 1/6 to 4/5 seconds, f/22, ISO 100, manual exposure, Center-Weighted metering. Mandy maintains that slowing down is the natural way to approach photography of the natural world. "Landscape photography is actually very slow," she says. "You're not shooting a wedding or an event. So many people want to rush out and get the shot. I tell them to slow down—and that's why we use tripods. A tripod is going to keep you stable, but it's also going to slow you down, to make you think about how you're composing. You're not just going to randomly hold up your camera and take a shot; you're going to really think about that composition. I might go out to photograph a sunrise and take five pictures because that's all it takes. I'm not going to take 500 pictures. I tell people to intentionally shoot every shot; make every shot with purpose, shooting with intention, do everything for a reason." And even take your time when the light is changing rapidly? Mandy admits that might be a time to speed up, but you should still maintain control of the situation. "At sunrise there's definitely a two-minute period when the light's best, and during that time I'll shoot more. But I will always get to a place an hour before sunrise, and I'll be set up and in my mind space, so when that two minutes happens, I'm ready." "I'd just shot sunrise in the Grand Tetons and was walking around a nearby farm. The light was just amazing, with clouds coming and going. I picked this horse as my favorite and waited for the light to be just right on him. Landscape photography is all about light, but it's the one thing we have zero control over, but what we can do is look for it and wait for it to be right." See the blue streak below the other horse? While zooming in to clean up dust, Mandy realized she'd caught a bluebird flying through. D800, AF-S NIKKOR 24-70mm f/2.8G ED, 1/160 second, f/10, ISO 800, manual exposure, Matrix metering. In Babcock State Park, West Virginia. "Most photographers who've shot in West Virginia know this grist mill. I often shoot places that are popular, so the key is how can I make a composition that's ideal for me. Here it was about getting the reflection just perfect—still, smooth water and all the colors in the reflection. A long shutter speed helped that." D800, AF-S NIKKOR 70-200mm f/2.8G ED VR II, 15 seconds, f/22, ISO 100, manual exposure, Matrix metering. The Little Sable Point Lighthouse on Lake Michigan. "My first time in Michigan someone told me this was a cool place, so I went at sunset and there were probably 500 people there. It was pretty, and I shot it, but it was lame. I came back at sunrise and was the only person there. But to get the light and the colors in the composition just the way I wanted them, I had to stand in the water. I had my tripod, but couldn't do too long an exposure because each wave that was crashing up would make the tripod sink a little more. I got wet, but I got the picture." D800, AF-S NIKKOR 24-70mm f/2.8G ED, 1/400 second, f/9, ISO 800, manual exposure, Matrix metering. Mandy's website, mandyleaphoto.com, features a gallery of images, information about her workshops and a behind-the-scenes blog about her life, discoveries and adventures. Mandy Lea is a landscape photographer living the simple life, traveling the country in a teardrop trailer. Mandy teaches photography workshops and speaks at events. She shares her adventures through her blog. Check out her website at www.mandyleaphoto.com.